Kalakendra Dwarka has had a 100% result so far for both Hindustani as well as Western classical music . In fact, every year, our students secured merit positions among all students of Delhi for the Trinity College (UK) examinations. All students of Kalakendra are regularly sent for various competitions and stage performance opportunities. They have been winning various inter-school competitions as well. Kalakendra also organizes Dwarka sangit-O-nritya Samman – an annual age-group competition in various categories of music and dance. The winners of this competition are recognized through prizes and certificates. They also get an opportunity to perform on stage as well. Each year, the annual celebration of the institute are celebrated in CCRT Auditorium, Dwarka. In 2007-08, the Annual Day was attended by a large number of Dwarka residents.The high point of the program was the sarod recital of Sri Suroranjan, a renowned artist of Indian classical music based out of Kolkata. His rendition of the instrument was really music to the ears present on the occasion. Chief guest for the occasion was Late Veenkar Ustaad Asad Ali Khan. In 2008-09, the students put up a wonderful show of music and dance – both Hindustani and Western. The occasion was graced by Chief Guest for the evening – Pt. Bhajan Sopori, the renowned Santoor player of India. The large audience constantly appreciated the performance of the students. 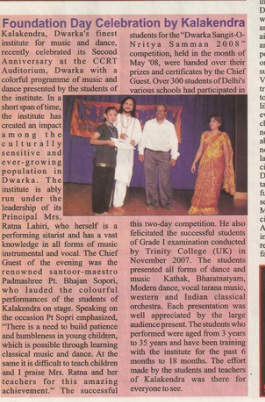 In 2009-10, the highlight was the ballet performance by students of Kathak, folk dance and western dance. The occasion was graced by the Chief Guest for the evening Vidushi Vaswati Sen, the renowned Kathak exponent. The evening was enjoyed by the large audience that gathered to appreciate the efforts of the young learners.